Within the circles of retro and arcade enthusiast, Star Wars is still one of the most highly regarded and sought after arcade cabinets from the era. Star Wars was developed and distributed by Atari, which came toward the end of their partnership which resulted in the games I have already spoken about in this series. While the game was being developed during the peak Star Wars hype that resulted from The Empire Strikes Back, the choice was made to base this arcade game on the events from the end of the original Star Wars. 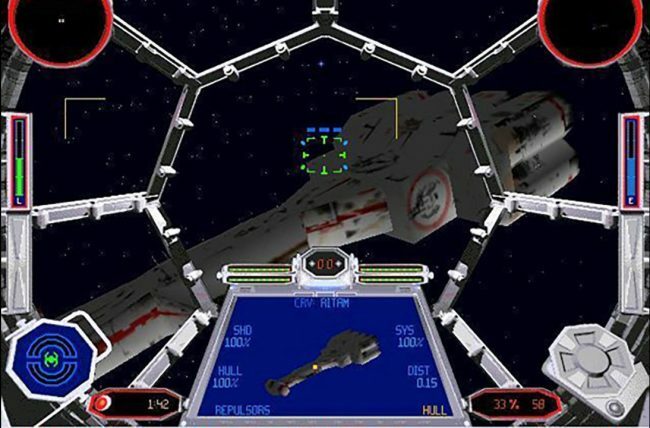 The player takes control of Luke’s X-Wing, inserting them into the final assault on the Death Star during the Battle of Yavin. To recreate this, Star Wars uses a unique yoke controller which gives the player relatively free control over their fighter. The lineage of this control scheme comes from beginning development under the eye of Ed Rothberg. Rothberg was a developer from Atari who was most prominently known for previously working on the arcade classic Battlezone, as well as games like Blasteroids. 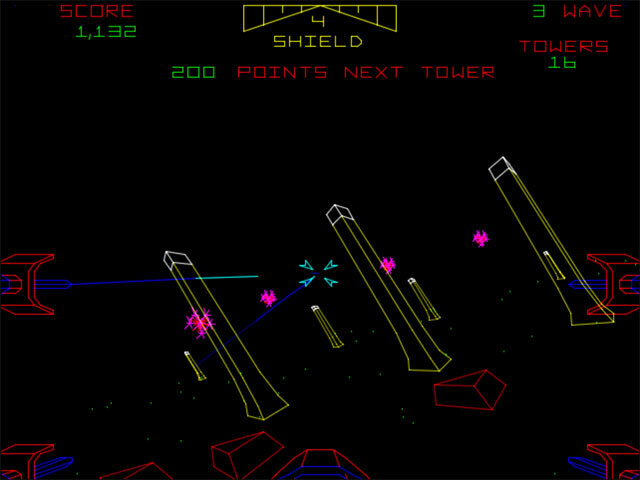 While Rothberg only worked on the game briefly before leaving Atari in 1981, the lineage between this game and Battlezone is difficult to miss. 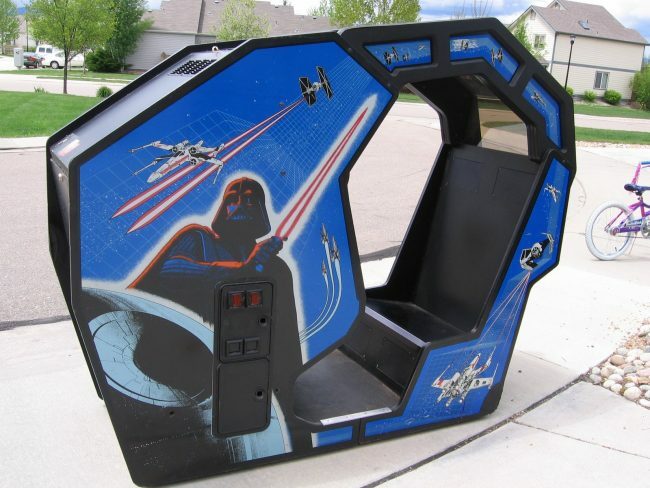 The custom yoke input used in the Star Wars cabinet is itself is a derivative of one of the inputs used for the Battlezone machines. That, combined with the wireframe based vector graphics make the comparisons difficult to avoid. After its initial release into arcades, Star Wars made a huge impact right away. Quickly, the free standing machine was iterated on and the cockpit machine was built, creating an even great sense of immersion for the player as they sit within the pilot’s seat of an X-Wing fighter. Star Wars was designed using Vector graphics, a style that made use of simple lines and curves to create images. This approach was used rather than the more commonly seen Bitmap approach which made images out of individual pixels. While Vector graphics quickly fell out of use as the industry grew and technology improved, there is no doubt that the wire frame models in Vector game create a striking image, one that had a number of advantages over the pixel graphics approach at the time. Playing this game myself, there is a uniquely ageless charm to this visual style. Most likely due to the fact they they never progressed beyond this point. As these images were projected onto a screen using lines made from an electron beam, it meant that no matter the size of the screen the game was being projected onto, resolution would remain perfect. Playing this today, the images seen on screen remain sharp and crisp in a way that some modern game still fail to achieve, even with a basic approach to art design. no matter how much the operators changed the size of the output on a screen. The simplicity of the line based graphics meant that even today, the images are sharp and crisp in a way that some modern games fail to achieve. 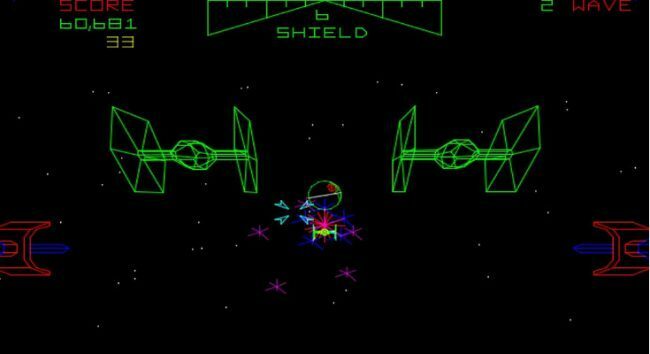 While simplistic to look at, the multicoloured lines that made up the images of the Death Star and enemy TIE Fighters, combined with the fast and responsive controls, it offset any bias that could have formed in my head when I approached this game for the first time myself. Arcade games of this era were sensory experiences as much as they were just video games. The need for them to stand out in a dark and noisy arcade made the design of the cabinet, the music and barrage of voice samples Mark Hamill, Harrison Ford, James Earl Jones and Alec Guinness all contribute to the game as much as what appears on the screen. As I previously mentioned, Star Wars puts the player in the seat of Luke Skywalker’s X-Wing during the Battle of Yavin. Recreating the final events of the movie in three individual stages. 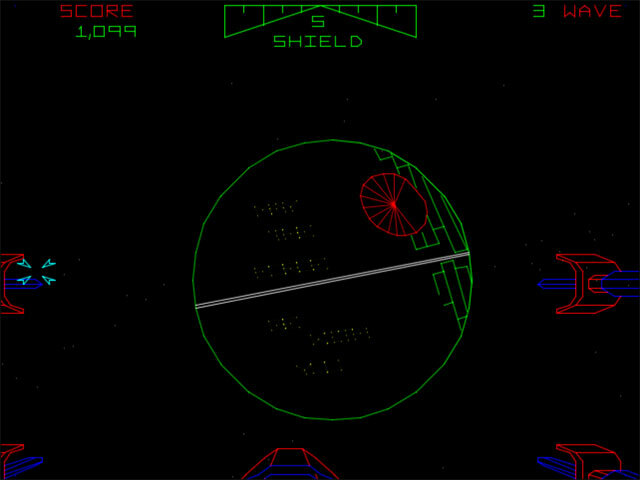 The first of which has the player approaching the Death Star from a distance, the primary task being to destroy the incoming TIE Fighters and avoid getting destroyed yourself. During these sections, Darth Vader’s fighter is also visible, the destruction of which will bag you the bonus points which are your main goal during this era of game. The second section has the player travelling along the surface of the Death Star, both avoiding and shooting the deflector towers and bunkers that litter the surface. This was the section of the game that impressed me the most. As a player, you’re given surprisingly free control over your fighter as you progress, meaning you can get as close or as far from the surface as you want. Upon approaching the station’s surface the size of the towers, as well as your relative perspective of them, changes quickly based on your altitude. It’s possibly the best example of why vector graphics were so good at the time, the smooth transition of size of your surroundings based on current perspective was something not seen in any other video game of the time. The final part is a recreation of the trench run, approaching the exhaust port that was the stations only weak point. During this section, you must avoid the catwalks that cross the trench as well as incoming fire from the turbolasers ahead and the pursuing Darth Vader Behind. At the end you get a chance to time launching a proton torpedo, destroying the Death Star and starting the whole process again. This whole gameplay loop takes around two minutes to complete. With the idea being to run it over and over, amassing as much of a point total as you could to attain arcade fame by immortalising yourself in the form of three initials on a leader board. While I was impressed with the utter barrage of bright colours, blaring music and non stop voice clips from the movie, there were issues I had with the game during my brief time playing it. During the second sequence of the loop, the part I was praising for its dynamic change in perspective ironically. Weaving around the defences of the Death Star is an exhilarating experience to be sure, one that impressed me over 30 years after the game was originally made. The problem is my innate desire to shoot and never stop shooting in this kind of game inherently damped my experience of it. While the vector graphics made for some impressively fluid visual transitions, there is no limit to the amount of visual noise happening on screen. Which meant there was nothing stopping me from overloading the limited 1980s hardware on which the game was running. By adding to the visual noise on screen through constant firing, the frame rate took a significant hit. We live in privileged times, in which we can criticise games for having inconsistent frame rates. I’ll be honest, I have no idea what the conversation around this was in the early 80s, if there was even a frame rate discourse going on at all around the critical video game community. Looking at Youtube videos of people playing the game today, I notice that many of them only fire minimally during the second and third gameplay segments, in which the impact of the slowdown is all the more pronounced. This is most likely a case in which I cannot separate my 2019 consumer sensibilities from the context of when the game came out, so take that with as big a pinch of salt as you’d like. 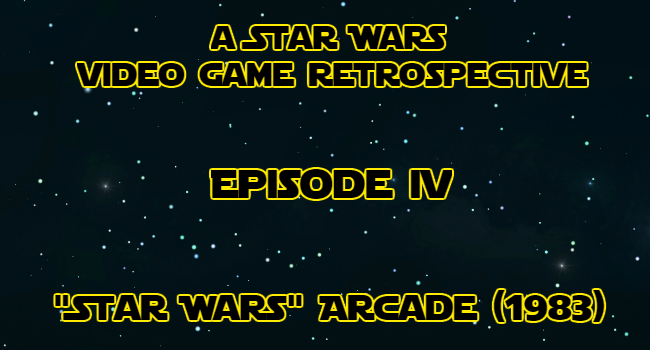 It probably goes without saying at this point that Star Wars Arcade did very well. It remains one of the most sought after arcade machines to this day, thanks in no small part due to Star Wars’s continued popularity and relevance. Atari produced 12,896 units of the game overall. Which might seem kind of quaint compared to the millions of sales publishers boast about today, but remember these were large arcade cabinets. There were no Steam sales to pad these numbers out back then. The machine received a couple of updates over the years, getting a conversion kit which added an Empire Strikes Back set of stages, which came with significantly more detailed wire models which featured segments from the Battle of Hoth and the Millennium Falcon’s escape through the asteroid field. There was also a Return of the Jedi update which featured more traditional bitmap graphics, using the game’s unique yoke to pilot speeder bikes on Endor. While there were no unique additions to the franchise’s greater lore from these games, their influence and ideas would most likely go on to influence other games in the franchise going forward. The likes of the X-Wing games and Rogue Squadron would eventually expand on the piloting games where this arcade game started. This being an arcade game meant that there were communities around setting world record high scores, which I’ve dove into previously. So I would be remiss to ignore it this time. Many of the early records of the game came down to a matter of endurance, thanks to the relative ease of the game when you had put enough time into it. A Robert Mruczek scored 300 millions points in a 49 hour session of game play, which was a world record at the time. Later, in 2005 Brendan Erickson would set a world endurance run of 54 hours on a single credit. 1994s TIE Fighter; a game which feels like the natural progression of what the original arcade game achieved. Twin Galaxies, the organisation that facilities the world record setting community surrounding video games, eventually decided to move away from encouraging people to take part in endurance runs. Instead, the standard play surrounding Star Wars Arcade become to play the game on the hard difficulty, making it a challenge of skill rather than endurance. Funnily enough, despite this change, the record is still held by former president David Palmer. Who, in a tournament in 1986, scored over 32 and a half million points in around 7 hours, a record that still stands to this day. I may have been a little critical of this game when talking about its performance issues, but honestly, in my time playing this game and subsequently researching it for this article, I have a lot of respect and appreciation for it. While a simple game, the complete package of both the cabinet itself, the control method and what we see on screen makes for an impressive sensory experience beyond its status as a mere video game. Which is part of the appeal for arcade enthusiast to this day. I can easily see myself being taken in by this game had I been growing up in the 1980s. The unique vector style of graphics makes it stick, even more so today, and the performance issues aside, the game is an impressively responsive and snappy game to play. It’s a game that I’d say still holds up, and while it might have no lasting legacy when it comes to the lore of star wars itself, it can’t be disputed the impact this would have on the arcade scene and video games in general going forward. Posted on March 1, 2019 March 1, 2019 by WooderonPosted in Star Wars, Video Game RetrospectivesTagged atari, battlezone, ed rothberg, episode IV, retro, Star Wars, star wars arcade, star wars video game retrospective, vector graphics.